I would like to share with you some new exercises that I recently developed. They have become the foundation of my hara development instruction. All of these exercises are variations on principles borrowed from progressive muscle relaxation (PMR). PMR was developed in the 1920’s by Edmond Jacobson, an American physician, and is still widely used clinically as a relaxation exercise. Over the next few posts I will introduce several exercises based on PMR. The first exercise, described below, teaches how to inflate the lower abdomen by taking a relaxed inhalation. I have discussed the importance of a relaxed inhalation in hara breathing in a previous post. You might want to review that before proceeding with this exercise. I have also included an instructional video of the exercise in this post. It is important to remember that hara breathing is a skill that must be developed through practice. So, like other skills, you will get more out of this exercise if you practice it regularly. 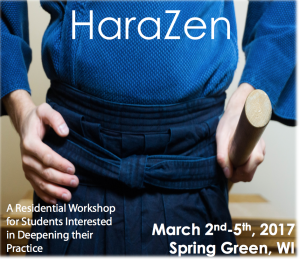 Additionally, I would like to call your attention to a hara development workshop that Alex Greene (featured in the video) and I will be conducting March 2-5 at the Spring Green (Wisconsin) Dojo. You can find more information about it at: http://institutezenleadership.org/portfolio/hara-zen/. Start by taking a deep inhalation. Inflate your chest as much as possible. Exhale as much of the air as you can. As you exhale, contract your abdominal muscles as much as you can. It should feel like you are trying to bring your navel to your spine. Without inhaling, continue to isometrically contract your abdominal muscles (navel to spine) as much as you can. Keep this tension for 10 seconds or longer. Even better, wait until you feel you simply must take a breath in. Suddenly, release the tension in your abdomen. Relaxing it slowly will defeat the purpose of the exercise. Focus on the sensation of relaxation in your lower abdomen. It should feel as though the relaxation effortlessly drives the inhalation. It may also feel like gravity helps you expand your lower abdomen. Go back to your normal breathing rhythm. See if you can maintain the sense of relaxation in your lower abdomen as you are breathing normally. After a brief period of normal breathing, repeat steps 1-6. The amount of time you wait will vary from person to person. Do NOT attempt this exercise on consecutive breaths. You can do this exercise either standing or sitting. However, maintain good posture either way. You may check out my earlier post on sitting postures. Discontinue the exercise if you feel lightheaded. Resume only when you no longer feel light headed. Hold your breath for shorter periods of time when you resume. If the lightheaded sensation continues, contact me. Pregnant women should not attempt this exercise without consulting a physician. If the exercise causes abdominal or other physical distress, consult your physician. Feel free to contact me if you any questions about this exercise. I would be happy to arrange a Skype session.